Lodge bonita no Yellowstone - Grande para caçadores / pescadores e famílias! Querencia Lodge é perfeito para grandes famílias e grupos. Elegantemente rústico e calorosamente hospitaleiro, Querencia Lodge possui seis quartos com entradas privadas de decks espaçosos, cada um com uma vista magnífica sobre o Absaroka, Gallatin e louco montanhas e do rio Yellowstone. Reserve um quarto, uma suíte ou todo o lodge. Os banheiros azulejados com chuveiros são privados e semi-privados e camas são Queen ou Twin. A espaçosa área de recolhimento possui um fogão a lenha antigo em um lareira de pedra levantada. A cozinha está pronto para o cozinheiro gourmet. Churrasqueiras e mesas de infravermelhos e carvão facilitar refeições ao ar livre. Você vai encontrar uma coleção de alguns dos melhores literatura de Montana na biblioteca. A especialidade Querencia é uma calorosa hospitalidade e informal: Faça-se em casa! Um mínimo de três noites é incentivada. A família Querencia pode ajudá-lo com todas as suas atividades favoritas: caminhadas, pesca, bóias rio scenic, rafting, passeios guiados para Yellowstone Park, passeios a cavalo. A pesca com mosca no rio Yellowstone é uma curta caminhada a partir da apresentação. Guiada por pesca com mosca, equipamentos e conselhos de pesca livre estão todos disponíveis. Existem inúmeras caminhadas de classe mundial com todos os graus de comprimento e dificuldade (guias disponíveis) nas proximidades, ou você pode tomar um laboratório bem treinado para uma caminhada. Caça de aves Upland com cães treinados estão disponíveis na época. Os observadores de pássaros vão desfrutar de todos os pássaros ocidentais, incluindo avistamentos muito perto de Águias. Depois de um dia ao ar livre mergulhar nas próximas fontes termais naturais e, em seguida, retirar-se para o som do silêncio quebrado apenas pelo vento ou do rio. Querencia é um destino fly-fishing especializado em riachos e córregos primavera cantaria da área de Yellowstone. É também uma base de operações para explorar Yellowstone Park (36 milhas ao norte entrada em Gardiner), o Battlefield Little Big Horn e todos ao sudoeste Montana, perfeito para solteiros, casais, reuniões familiares ou retiros de negócios. Crianças e animais de estimação bem comportados são bem-vindos. Canis estão disponíveis para os hóspedes. Querencia Escola Fly-pesca: um curso personalizado 3-5 dia de instrução e pesca guiada para iniciantes e intermediários mosca-pescadores. Tudo o que você precisa saber para pescar com sucesso e sem assistência está incluída. Viagens para os rios e córregos de Yellowstone Park, os riachos e córregos primavera cantaria de Paradise Valley e do Rio Yellowstone estão incluídos. Viagens para o Big Horn Rio e do Rio Missouri estão disponíveis com guias experientes e barcos. Querencia Cooking School: uma estadia de três noites inclui a preparação de três jantares gourmet e cafés da manhã. Os hóspedes dividem o custo dos ingredientes e vinho. Forno holandês cozinhar em fogo aberto é uma especialidade Querencia. Faisões, patos e gansos: Guided caça com labradores treinados nas ilhas do rio Yellowstone está disponível na temporada. 'Querencia "é uma palavra espanhola que é usada para significar que a área na arena vida onde se sente seguro e sereno. A palavra descreve perfeitamente Querencia Lodge, perfeito para você e seu. Another visit to one of our favorite places. This is a very comfortable house in an ideal location .jorvmakes a huge effort to offer suggestions and attend immediately to any small issues that may arise. Well equipped with Leicester linens on comfortable beds. Eating outdoors in the evening surrounded by Mountain View’s cannot be beaten. Just PERFECT! We felt like we visited a friend that we already miss. 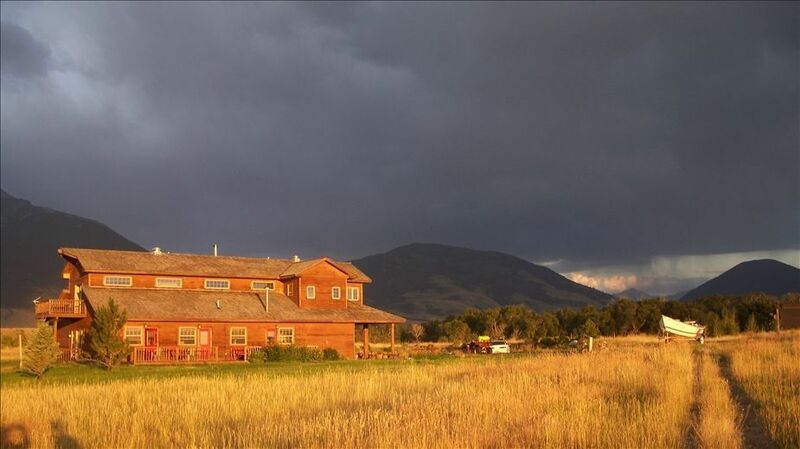 When you think Montana, you think of a lodge out in the middle of nowhere. This is it! It’s about 15 minutes to Chico Hot Springs one way, Livingston another and Gardiner south. We enjoyed all three. The lodge and the surroundings are all just beautiful. The owner operates a dog kennel on the property and has chickens. The children especially enjoyed the dogs. We enjoyed Joe, the owner. We also enjoyed the fresh eggs he brought in daily. It was a very short walk to the Yellowstone River and beautiful scenery all around with two or three different mountain ranges. We loved the decor of the lodge. Everything we needed was right there. I hope to be able to stay there again next year. Tell Joe hello for me!!! What a great time was had by all. We are an extended family who enjoy getting together every year and this is the best there is for us. Everyone has a comfortable bed and easy access to a bathroom. We can take our beloved pets who usually have to stay in a kennel at home. This is our second stay at Querencia and we plan to return again next year. We take turns making dinner. Every adult gets to cook their favorite one night. Joe who is an excellent cook is available if needed. There is access to a river boat trip if one wants. Either MIke or Joe is a great guide if you want to get on the river. The river is closeby , walking distance, and the fishing is good. One of our party flies drones and there is a clutterless field for him to fly in...no telephone wires, no trees, very clear. I can't say enough good about the lodge with Joe and Mike looking after our welfare. The kitchen is exceptionally well equipped. These were excellent accommodations for my family of 9 to visit Yellowstone and explore and hike the local area. Gorgeous location, western decor, well appointed and delightful, laid back hosts Joe & Mike. The only improvement would be a "woman's touch" to better organize the kitchen particularly. All in all, a great vacation! Beautiful lodge with great views. Our family of 16, including 2 small children, enjoyed our time together. Plenty of room to eat, sleep, and mingle. Teenagers & young adults especially liked the campfire each evening. Close enough to Chico to make several trips a day (just make sure to get a wristband for re-entry at the hot springs). Host Mike was very friendly and accommodating. Only complaint is that I spent a couple hours cleaning the kitchen upon arrival ... but, all in all, a great experience. Would like to go back during the summer to explore more outside, walk the trail to river, etc. To rent the entire property during high season (June 15 - Sept 14) we charge $3500 for a 6 night/7 day stay.